With the cold wet weather encouraging us to stay warm and indoors it is no wonder the youngest among us complain of being bored. 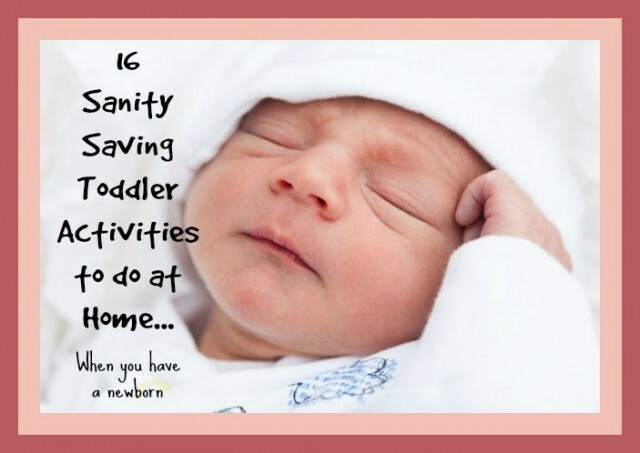 Now usually I don’t allow that word in my home as can be seen in this post from the past, but when you have just given birth, are still recovering and stuck home alone in inclement weather, what can you do to save your sanity? I joined in a discussion on social media recently about just this topic and thought I’d share with you the ideas I gave this second time round mother who was feeling the stress of being home with a newborn and a tireless toddler. That don’t require too much hard work and effort on your part! Toddlers love boxes. If you have a large old box that you no longer need, throw some crayons in it (and your older child) and let them “design” the inside. They could scribble, decorate or draw realistic images. A pack of stickers can also add to the enjoyment. Use a roll of masking tape and stick it in tracks all over the floor/carpet and have your toddler drive their toy cars along the “roads”. Again using masking tape to create a course, have your toddler roll a tennis ball along it using a wooden spoon, tricky and funny! Baths are not just for bath time. Put your toddler in a shallow bath with lots of cups, sponges, spoons and whisks, ladles and other interesting items to explore pouring and filling. If you are feeling extra enthusiastic, you could colour the bath water with bath colours or food colour. More bath time fun can be had by making a variety of coloured ice blocks using food colouring (-obviously freeze over night). Put your toddler in the bath and drop the ice blocks in at intervals. Let him play with them as they dissolve. Get your hands on a pack of bath crayons. Your toddler will love being given permission to draw all over the bath tub. And the added bonus is that his bath time will be done! 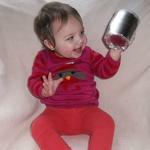 Teach colours and occupy your toddler. Choose 5 colours and place them on the floor or table (works well if you have coloured paper or fabricor even large bowls or buckets) Send your toddler on treasure hunt to find 5 things that match the chosen colours. To stop him pulling apart every room in the house, you could stipulate that all items come from his room or the toy room. Fill a tray or large bowl with rice. It does not have to be coloured. Give your toddler a spoon, a bowl,and a cup and let him explore with the texture and filling the objects or pouring the rice. Put your toddler’s favourite CD in the player and play musical statues or bumps. It’ll burn off some energy and make you feel good as only music can. Children enjoy falling onto soft surfaces (that’s why soft play centres are so popular) so recreate this effect by throwing all your cushions or pillows – or both-on the floor and let him explore and roll about. Create a hideaway for your toddler by throwing an extra large tablecloth over your kitchen table so it touches the floor on at least 3 sides. Put cushions in the den and a pile of books…he can play under the table look at books. Be an explorer and go on a hunt around your house. Make him a pair of explorers binoculars out of toilet rolls and play eye spy using colours instead of spelling..you could get him to help make the binoculars before you get started on the hunt. Toddlers love collections of things. Help him sort and organise a collection of items by giving him an empty egg box (6 or 12 spaces) . Ask him to find things small enough to fit in each space. Talk about the things that fit and those that don’t. Use size words (big, small, tiny, huge)..fun and educational. Get into the kitchen and make a pot of no cook homemade play dough? Let him choose the colour and once it is ready, give him your rolling pi, some spoons or plastic forks and bowls and let him create. All these toddler activities at home are simple, quick and you should be able to organise, even with a newborn clinging to you. Repeat them daily- your toddler won’t mind- until you and new baby are feeling stronger and ready to face the world again. * As always, be vigilant when your toddler is handling small items as he may put them in his mouth. Children should be supervised whilst in the bath.